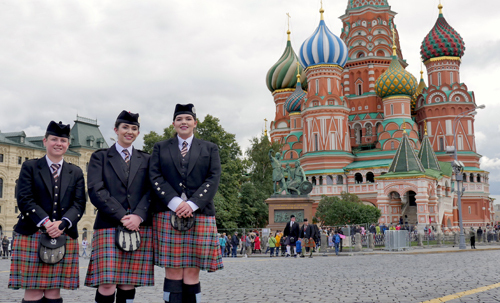 True North: Raphoe to Red Square follows three young women from the border regions of counties Tyrone and Donegal as they travel to Moscow to take part in the Russian Tattoo. The programme, which broadcasts on BBC One Northern Ireland tonight (Monday 20th November) at 10.40pm, received funding support from Northern Ireland Screen’s Ulster-Scots Broadcast Fund. In 2007 Vladimir Putin decreed that he wanted his own military tattoo, a celebration of marching and music that would be even bigger and better than Edinburgh’s world-famous event. This year, 70 musicians from Ireland formed part of a 122-strong pipe band that performed in Moscow’s Red Square as part of the Spasskaya Tower Tattoo’s 10th anniversary. Victoria, 21, a part-time sheep farmer, journalist and country music promoter from Castlederg, is a piper in the Donegal-based Raphoe Pipe Band. While Victoria is a self-confessed tomboy, her friend Chloe, 19, from Raphoe loves the limelight. A part time wedding dress model, Chloe is the bass drummer with Raphoe Pipe Band – the only female bass drummer among 11 travelling to Moscow. Chloe’s sister Robin, 21, is a ‘goth’ with more than one tattoo on her own skin. Robin was quite shy until she built up her confidence playing the tenor drum in the Raphoe band. All three women are very different, but are united in their love for the music they play and the Ulster-Scots identity they confidently assert and celebrate. The 122 members of the band will not have played or marched together until they meet in Russia, and even then, there will only be a two-hour rehearsal on Red Square. Will they have what it takes to perform in this iconic arena? And when bad weather devastates the north west of Ireland, will the three friends even make it to Moscow? Filmed and directed by Bob O’Brien, True North: Raphoe to Red Square was produced by Barking Films for BBC Northern Ireland.